Children with vulnerable immune systems, such as the very young, HIV-infected or severely malnourished, are most at risk for falling ill or dying from tuberculosis. Children with tuberculosis are often poor and living in vulnerable communities that lack access to health care. Adolescents are at particular risk of developing adult type disease, i.e., often sputum smear-positive and highly infectious. 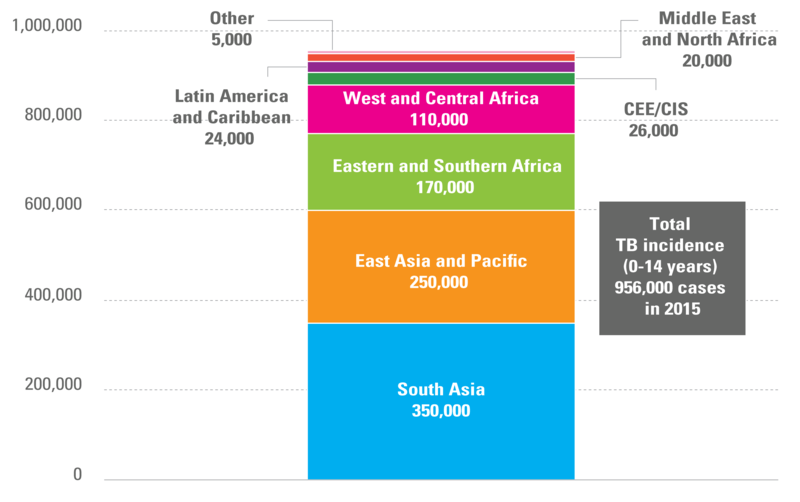 Tuberculosis is now the leading cause of death from infectious diseases globally, with an estimated 10.4 million new cases in 2015, 1 million of which were in children under age 15. Only 39 per cent of the estimated child tuberculosis cases were notified to tuberculosis programmes, pointing to massive under- diagnosis. In 2015, some 210,000 children died of the disease (about 575 children per day). Children represent about 10 per cent of all tuberculosis cases (1). More than 67 million healthy children have latent tuberculosis infection and are at risk of developing the disease in the future,(2) and only 7 per cent of at least 1.2 million eligible children received preventive therapy in 2015. (2) Researchers estimate that more than 25,000 children develop multi-drug-resistant tuberculosis every year. Data to measure tuberculosis incidence come from countries’ routine reporting on case notification and treatment outcomes, supplemented by national tuberculosis prevalence surveys (22 of which have been conducted between 2009 and 2016).